Sad news. 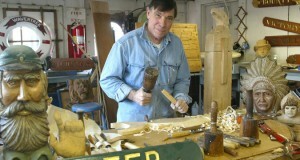 Sal Polisi, the master woodcarver at the South Street Seaport Museum, died on January 18th aged 79. Sal was a wonderful man who led a fascinating life, or rather multiple lives, and I was fortunate enough to meet and profile him for my book New York Waters. With the recent death of John Doswell, who also did so much for the city’s working waterfront, New York’s shoreline becomes a blander place. Read Margalit Fox’s obituary of Sal in the New York Times here.